About an hour after Friday night's YBN Nahmir show wrapped up down the street, five local hip-hop acts began to take their turns on the Replay Lounge stage. Kansas City's Domineko sat at the top of the bill, but as the 2:00 A.M. hour neared, his set was cut short to a mere 15 minutes. Neko was, however, able to squeeze in guest appearances from Pistol Pete and Mike C and a few tracks from his upcoming release "Perfect Weekend." Topeka's Young Mvchetes opened their set with another Martin Luther King speech before kicking off a highly impressive set that was anything but peaceful. Ricky Roosevelt and Alccalh offered up a sampling of the Vivid Zebra rapper's discography including cuts from "In The Dark," "Legacy," and "Double R, Vol. 1." 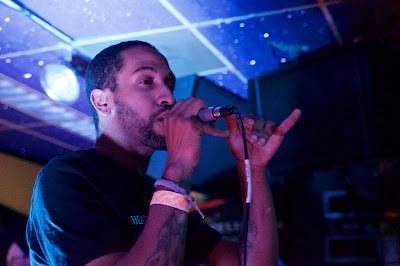 Joey Origami's "Inheritance" was an early standout at the late evening show and King D used his set to welcome fellow Ark members Big Sav, Baby D, and Sunflower to the stage.